Cooling Source will meet or exceed all Customer and other applicable requirements. We will strive to exceed customer expectations by engaging and challenging our talented personnel to continually improve each process and system. CSI offers the most comprehensive value-added standard and custom heatsink solutions, including the latest technology to a wide range of markets. We provide design assistance and thermal analysis to help the Customer achieve its goals. 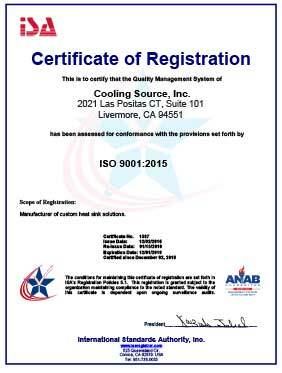 CSI has an ISO 9001:2015 certified manufacturing subsidiary in main land China and a manufacturing facility in Livermore, CA to ensure you the lowest cost, best quality and supply chain continuity for your volume production.